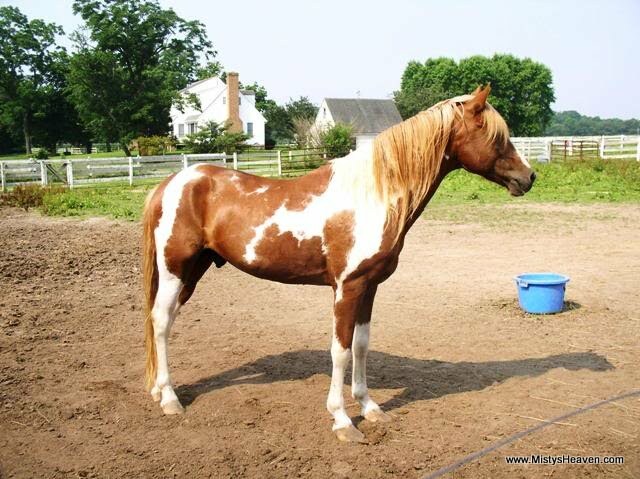 Cezanne was a chestnut pinto stallion owned by Kevin McBride, a well known Chincoteague painter. He was the highest priced foal, selling for $2,500 in the 1989 auction, and was a record that wasn't broken until 1994. Cezanne, named after the famous French impressionist painter, has been featured in a number of McBride's paintings. Cezanne has made appearances at his owner's Chincoteague art gallery several times. The 2001 Pony Penning print depicted Cezanne with Black Mist and their daughter Morning Glory. McBride's 2005 Pony Penning print features Cezanne's five foals that he sired in 2004. To see McBride's paintings featuring Cezanne visit the website of the Osprey Nest. Cezanne lived on the Allen farm for a number of years siring both Misty and regular Chincoteague foals. His Misty offspring are 1998 chestnut gelding Misty's Scorcher out of Misty's Heat Wave, 2001 black pinto mare Misty's Morning Glory out of Misty's Black Mist, 2004 chestnut pinto mare Misty's Cloudbursts out of Misty's Desert Sun, 2004 black pinto mare Misty's Storm Chaser out of Misty's RainDrop, chestnut pinto colt Misty's Dust Storm out of Misty's Desert Sun, 2006 chestnut pinto mare Misty's Snowdrop out of Misty's RainDrop, 2007 black pinto gelding Misty's Irish Mist out of Misty's Black Mist, 2007 chestnut pinto mare Misty's Moonshine out of Misty's Desert Sun, 2007 palomino pinto mare Misty's September Stardust out of Misty's Heat Wave, 2007 palomino gelding Misty's Sunfire out of Misty's MayDay Twister,2008 chestnut stallion Misty's Riptide out of Misty's Partly Cloudy, 2008 chestnut pinto gelding Misty's Thunderbolt out of Misty's RainDrop, 2008 chestnut pinto gelding Misty's White Out out of Misty's Hurricane Izzy, and 2012 chestnut pinto mare Misty's Summer Breeze out of Misty's Partly Cloudy. He is one of the most prolific sires of Misty family foals. Cezanne passed away of colic on January 15, 2012 at his home at Hawkeye Stables in Ridgely, Maryland.